Here’s evidence that music licensing laws are completely outdated. The movie Mr. Bean’s Holiday currently playing in theaters probably won’t win any Oscars but I believe that one of the title music tracks, “Crash” by Matt Willis is pretty good. I learned about it through a Mr. Bean video released on YouTube earlier this year and figured that I would purchase the song. Unfortunately, due to botched licensing agreements, there is no legal way to buy the song if you live in the United States. In the era of iPods, iPhones, and music enabled mobile devices, it’s absolutely absurd that these archaic geographic-based licensing agreements continue to exist. 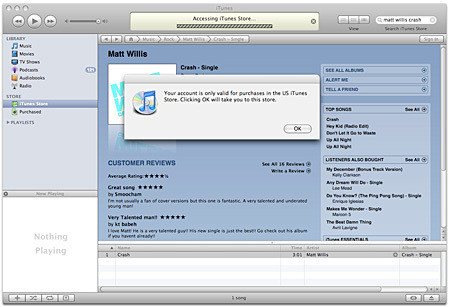 Apple has suggested to major record labels that similar restrictions and DRM be dropped from future offerings, and Amazon has decided to offer digital music downloads, but only from record companies who agree to offer DRM-free music. This week NBC announced that they are pulling television content from iTunes because Apple would not support raising the price of downloads from $1.99 to $4.99 per television episode. Clearly, the old media providers are failing to adapt to the times, are attempting to assert their force on technology companies like Apple, and the consumers and artists are losing. 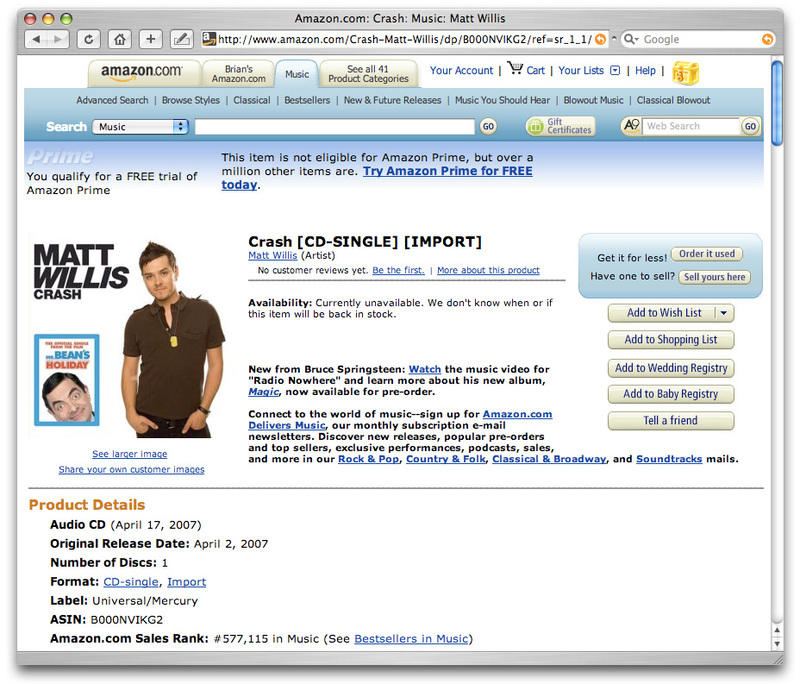 Today, I tried to purchase “Crash” from iTunes, Amazon, Wippit, and Mercury Records (Matt Willis’ own record label! ), and none would sell it to me. (And you wonder why illegal file sharing has a bright future?) The following are screenshots from my stymied shopping experience. 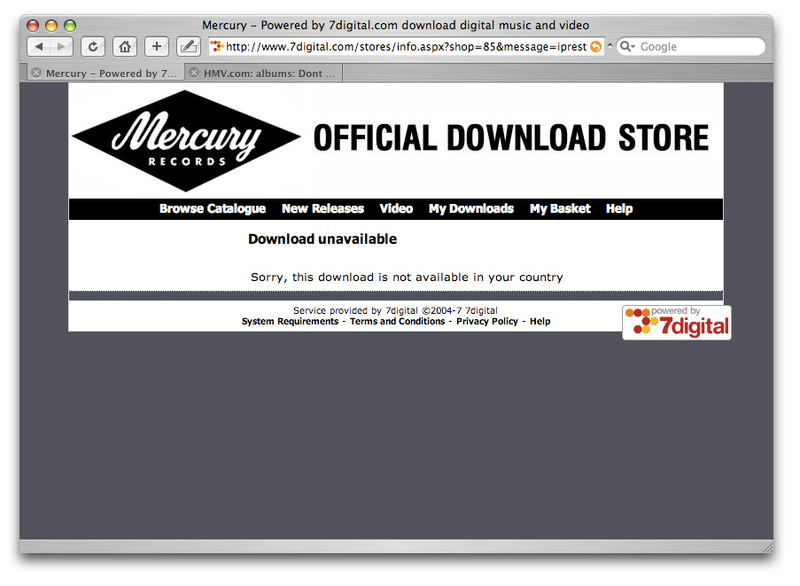 Can’t buy from Matt Willis’ own record label, Mercury Records! 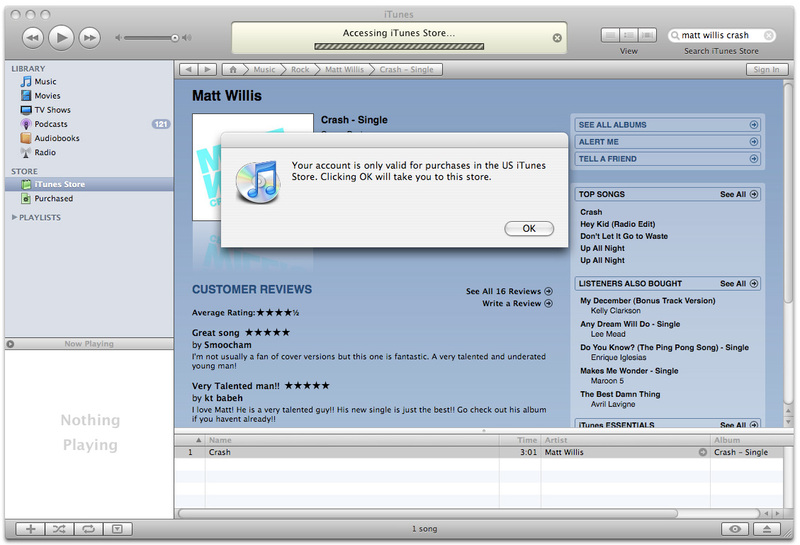 Sorry, Matt Willis — I tried to buy your music but no one representing your interests would sell it to me. Bummer. This entry was written by Brian McNitt, posted on at 12:38 pm, filed under Music. Bookmark the permalink. Follow any comments here with the RSS feed for this post. Post a comment or leave a trackback: Trackback URL. Ugh… I just tried too. 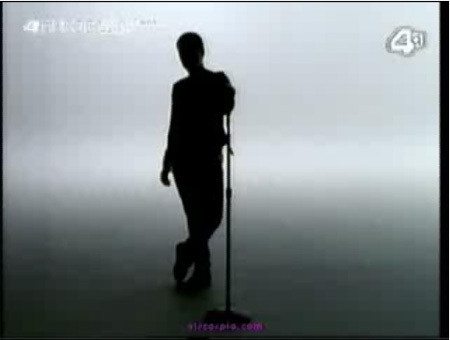 I want this song!